I simply couldn’t believe my eyes and had to read it again, then shrieked out loud! Congratulations for placing first in the Midarm/Longarm quilting category of the National Juried Show. Your piece is beautiful! I am the editor of The Canadian Quilter. I was wondering if you would let me put your quilt on the cover of the magazine. It is so colourful and so well done, it would be a great honour to have your quilt on the cover. Well, let me think about my answer for a nanosecond, YES!!!! 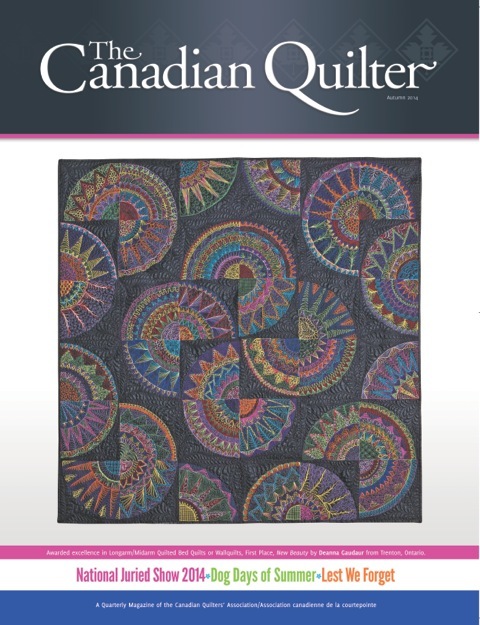 Canadian Quilter is the magazine published quarterly by The Canadian Quilter’s Association and is distributed to all its membership and to the quilt guilds across Canada! And yes, I was happy to write an article for the magazine. And the cover looks marvellous, thanks to Michael’s very fine photography. It is available to purchase online here, and here is the picture of the cover. Notice the pink line has my name in it!